We were thrilled to be part of the Queen's special birthday celebrations this April as the ThermaTech® as taken up to the Westbury White Horse to give it a thorough clean for the Queen. Led by Steve Carrington from the local Rotary club and supported by enthusiastic local volunteers, we even managed to capture some drone footage of the cleaning thanks to Ocuair. The Westbury White Horse is a unique national landmark, and we were excited to return on-site after having already helped clean the horse back in 2012 (read all about it on our blog). The history of the White Horse stretches all the way back to ancient Saxon times, so it seemed like the perfect way to commemorate 90 years of Queen Elizabeth II's rule. On Thursday 21st April at 7.30pm, the evening of the Queen’s actual 90th birthday, the newly-cleaned Horse was lit by beacons, lighting up the Horse and the surrounding landscape in celebration. Beacons were once part of an ancient signalling system used throughout Britain to warn rulers and residents of danger, making the beacon a fitting token of appreciation. The horse, known locally as the Westbury or Bratton White Horse, sits just below an old Iron Age fort known as Bratton Camp. Bratton Horse was thought to have been initially carved to commemorate the Battle of Ethandun, reported to have taken place in AD 878 at Bratton Camp. Carvings were a way to commemorate and document events for future generations. Originally carved in the 17th century, white horses were used as symbols of Christian victories over the Danes. Carving them into the hillside was seen as a way to celebrate the early unification of Christian Britain. Its unique grasslands now support a diverse ecosystem of rare and endangered species and the Horse is a much-loved part of the local Wiltshire landscape. 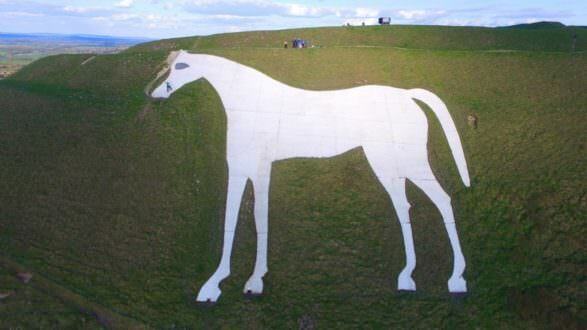 Technically no longer a carving, the White Horse is now a concrete horse painted over in white, needing regular cleans to maintain its shine in Wiltshire's wet conditions. The Horse particularly needs periodic maintenance and cleaning to stop it from turning grey from weathering, algae and lichen. Thankfully local residents are always ready to do their bit for the Horse, happily stepping into the breach in April, as they had done for the previous clean during the Diamond Jubilee back in 2012. Cleaning the Horse can definitely be compared to abseiling and it attracts some daredevil volunteers. In fact, upwards of 20 local volunteers spent two days in April steam-cleaning the 175 foot landmark with the help of cables and safety harnesses. Quoted in the Horse & Hound, Steve Carrington praises the volunteers' enthusiasm “It was a herculean effort on the part of all the volunteers". It's great to see the ThermaTech® being used on such a special occasion, and we were thrilled to be involved in this landmark restoration project again.